Motorcycles inspire people to do the most fantastic things. Take for example the British actors Ewan McGregor and Charlie Boorman, who on a whim pulled out an Atlas and decided to circumnavigate the globe. Or consider the lesser known but well-respected Helge Pedersen, who left his home in Norway way back in 1981 to travel around the world. He did it in 10 years. Yes, 10 years is indeed correct. I said motorcycles inspire you to do fantastic things, but they aren’t necessarily sane things. 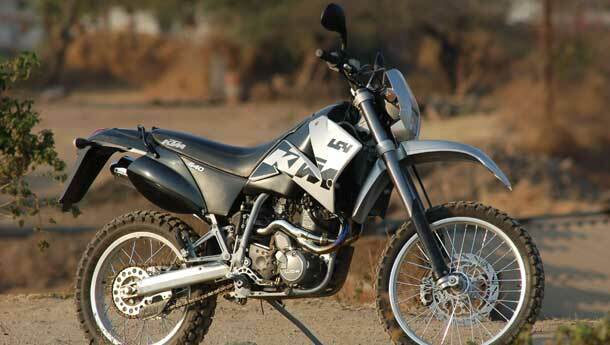 Which is what brings me to this motorcycle – the KTM 640 Enduro. It’s just the motorcycle you’d want to swing a leg over after a long day and do something completely insane, completely out of this world. My vision of a KTM was a big orange dirt bike covered in mud, so a peek into Raju Sheikh’s (our Pune-based mechanic friend who organised the 640) pick-up had me a bit disappointed, as it was a glossy black and silver 640 that I spied. But a KTM it was. And I’m not really sure why I’m complaining, because I had just spent the entire morning testing a boring 100cc commuter in Pune’s blazing sun. The 640 was like my watering hole in a desert of monotonous little commuters, then. 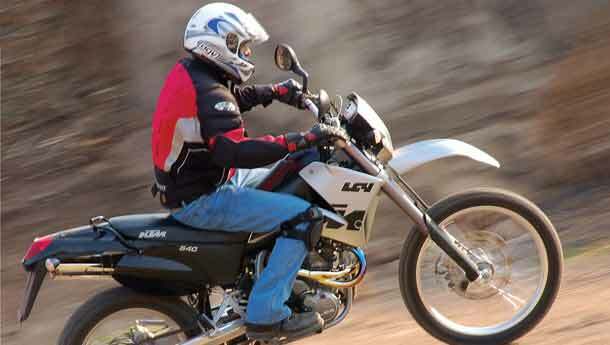 Raju Sheikh, besides being a mechanic, is a big motorcycle enthusiast as well. He had a location in mind where he said we’d be able to truly experience the motorcycle. He led us down the Pune-Mulshi stretch to a large water body where he unfastened the tie-downs and rolled the KTM and the DR 750 Big (check out BSM April 2005) off the pick-up bed. The beasts were unleashed and the keys were handed over. Let the games begin, then. The DR was indeed big, muscular and prominent and overshadowed the tall, lean, sleek looking Katoom. But that hardly mattered, especially since I’ve put riding a KTM on the top of my must-do list after following Marc Coma’s adventurous win at this year’s Dakar. And I was dead serious about it, even it meant tackling colleagues like a pro linebacker to get the keys. Thankfully, it took much less. My first impressions of the Enduro were that of just another modern dirt bike. A micro mini bikini fairing with a flat rectangular head lamp didn’t exactly enhance the looks, but a purposeful front mudguard with a cowling around the tank had distinct lines. The seat was no two-seater plush cushion, but a very basic single seat that found its way halfway up the tank. Bringing up the rear was a very triangular looking tail lamp that ended in a mud flap. The 640 Enduro, I’m sorry to say, isn’t a very beautiful looking motorcycle, but then when was the last time you saw Heidi Klum come out of a mud-wrestling match unsplattered? Stubby mirrors and signal lights made the 640 street legal, while a beefy Magura handlebar with a multifunctional meter, upside-down forks and a huge disc rotor gave it a more serious look. Once you swing your leg over, you know just how serious the 640 is. You can immediately feel the 150 plus kg shift to your feet, which I might add are barely touching the ground as the seat is about three feet from terra firma. The 640’s got a single cylinder 625cc four stroke engine mounted into its chrome molybdenum steel frame. Chrome molybdenum isn’t just a big word that’s used as a marketing gimmick, it is a lower-carbon steel alloy that has increased rigidity and tensile strength and can handle high levels of stress. The LC4, the Enduro’s single cylinder engine, dates back to 1987 when it replaced KTM’s air-cooled 600. Over the years, its gained a number of upgrades including counterbalancers for the crank and camshafts and even an electric starter to evolve into a refined 625cc liquid-cooled thumper. The throttle response from the LC4 is phenomenal. Sending the revs through the ceiling is as easy as flicking your right wrist as I found out in a rather scary one-wheeled moment. That very flick unleashes a stump pulling 5.5 kgm at a low 5500 rpm. The LC4 puts out 55 bhp at 7500 rpm, which is capable of taking the LC4 to a steady 165 kph, although you might not want to try those triple digit speeds on tarmac as the stock semi-knobblies aren’t famous for holding on to blacktop in a corner. This Katoom has a WP monoshock at the rear which has about 11 inches of travel, while the upside-down forks offer a good 10 inches. The suspension is well damped and so effective that it made me want to do an Evil Knievel stunt off the high road on to the banks of the lake. (I’m sure it did - Nandu) The KTM 640 Enduro was just the motorcycle I needed to perfectly complete my day. It was loads of fun and more. A set of road going tyres and I’d probably be off on a road trip to the mountains right away. Like I said before, motorcycles inspire you to do things. While it’s not some impulsive round-the-world trip that I’m planning, I’m looking at maps of the Indian subcontinent but I can’t really pick a machine that I could ride. Maybe a KTM would do just fine.